Scottish proverbs with accompanying glossary of Scottish words and terms by the Free Church of Scotland minister, Alexander Hislop. 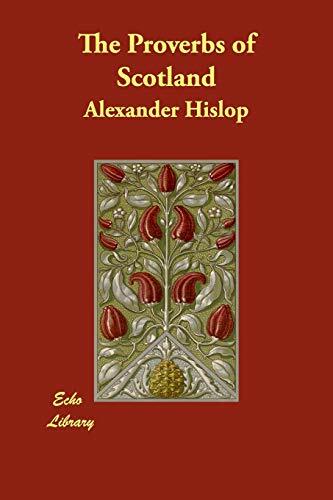 Alexander Hislop (1807-1865) was a Free Church of Scotland minister infamous for his outspoken criticisms of the Roman Catholic Church. He was the son of Stephen Hislop (died 1837), a mason by occupation and an elder of the Relief Church. Alexander's brother was also named Stephen Hislop (lived 1817 1863) and became well known in his time as a missionary to India and a naturalist. Alexander was for a time parish schoolmaster of Wick, Caithness. In 1831 he married Jane Pearson. He was for a time editor of the Scottish Guardian newspaper. As a probationer he joined the Free Church of Scotland at the Disruption of 1843. He was ordained in 1844 at the East Free Church, Arbroath, where he became senior minister in 1864. He died of a paralytic stroke the next year after being ill for about two years. He wrote several books, his most famous being The Two Babylons: Papal worship Revealed to be the worship of Nimrod and His wife.